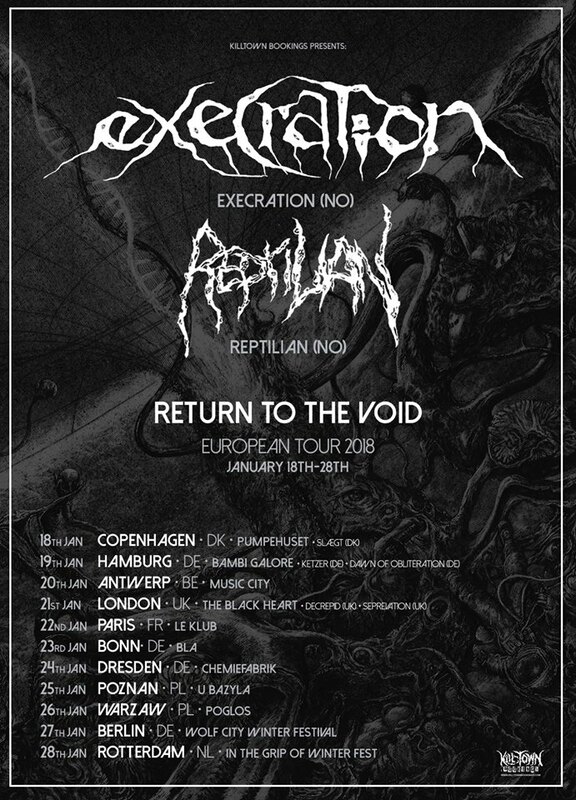 Killtown Bookings is proud to announce the final routing for two of Norways finest death metal outfits; EXECRATION and REPTILIAN! The tour will be called “RETURN TO THE VOID” and will take place from the 18th – 28th of January 2018 – with only 11 exclusive shows in north and central Europe! In July of this year, EXECRATION released their much anticipated 4th full length “Return to the Void” on Metal Blade Records to much praise from the international metal press. Unlike the previous two albums, the new album, doesn’t mark a dramatic stylistic shift. The band comments: “It is our most compact album to-date, shorter and with tighter compositions. It’s catchy, complex, prog-infused and intense all at the same time. Coming off of two double 12″ vinyl albums, the first clear goal for writing ‘Return to the Void’ was to deliver the same kind of dynamic and shifting song-writing in a more condensed to-the-point package. Stripping songs down to their essential core has been a driving force while writing, and it shows – there is not a wasted moment on the album. Ticking it at 42 minutes – a perfect fit for the vinyl format – the album takes the listener through a whirlwind of thrash, death, black, and even heavy metal, fast and slow parts, and the trademark Execration shifts in mood, tempo, and atmosphere. As with the previous two albums, we wanted to capture the feel of a live performance, so all the basic tracks (drums, guitars, bass) were recorded live in our rehearsal studio in Oslo over the course of a weekend. Vocals, synths, and various effects where recorded the following weeks with assistance from Andreas Tylden (One Tail, One Head / Altaar). The album was then mixed and mastered by Tom Kvalsvoll of Kvalsonic Labs. With them on tour they are bringing REPTILIAN also from Norway. Signed to Edged Circle Productions they have released 1 full length album back in 2016 called “Perennial Void Traverse”.